Six Year 12 students were successful in their applications to be chosen to represent JRCS in the selection process, run by Herbert Smith Freehills LLP Law Firm in London, for their Networked Scholarship programme. 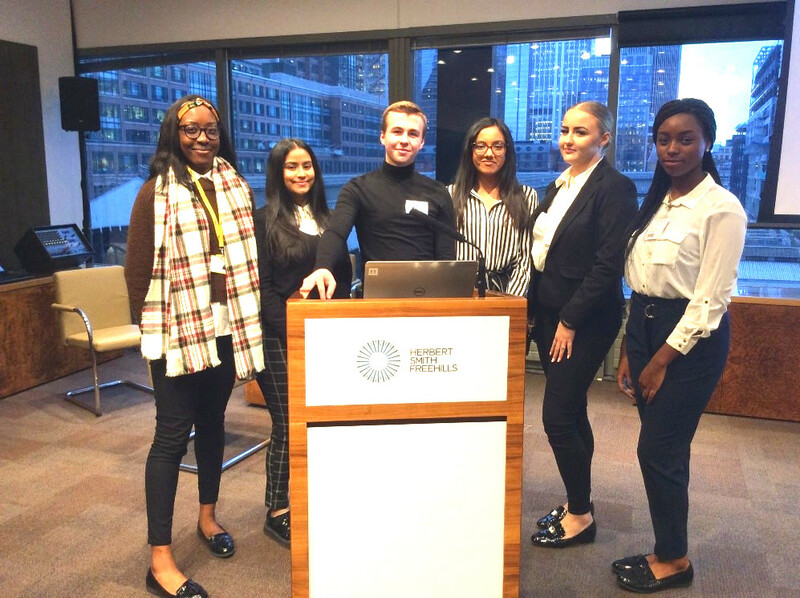 The six had been selected to attend a workshop, on Monday 21st January, to find out information about the scholarship opportunity that the firm offers selected London students. The workshop gave the students the chance to see the different departments that operate in a city law firm (business side as well as legal side), they had a tour of the amazing offices based at Liverpool Street and an insight into what their application needs to consist of in order to be successful. They were also able to experience a corporate style buffet lunch. Students will have the opportunity to undertake a five year scholarship which will see them gain an individual mentor, attend a Summer internship at the end of Year 13 and also receive financial support whilst at university. Keren Mbo; Tasnia Haque; Reece Johnson; Anmona Siddaqua; Guste Rudzinskaite and Pamela Dicko.